The "National" classes are usually those out of the local area and are lectures, workshops and retreats. Click here to view National classes currently scheduled. This list provides the dates, locations and contact information for attending these classes. 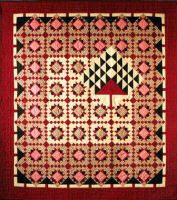 Lyn is always available to quilt guilds and has a series of lectures and one day workshops ready to put on. Click here for descriptions of these lectures and workshops. If you are in charge of guild programs and would like Lyn visit your guild, Contact Lyn for fee information and scheduling.